Replacement of cement mortar / screed. No crack formation. No shrinkage. No curing required. Upto 120mm mortar can prepare in one stretch application. A factory prepared blend of carefully selected raw materials, Portland cement and graded fillers, it is designed for use with water and aggregates to produce high strength, water retaining and self curing screed for interior and exterior floor applications. It meets and exceeds the requirements of National and International Standards. 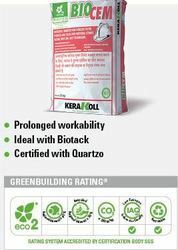 Manufactured by Ferro Chem India Ferric-oat- 30 Liquid Floor Hardener is a plasticizers based liquid floor hardener admixture for various concrete solutions. It increases flow of concrete thus helping reduce water in the structure and increase life and strength of concrete. HYGROSMART-FLEX® is a two component waterproofing mortar based on cementitious binders, synthetic, inorganic polymers, high technology additives and synthetic polymers in a water dispersion. A screed sits between the structural sub-floor of the actual foundation and the flooring material. 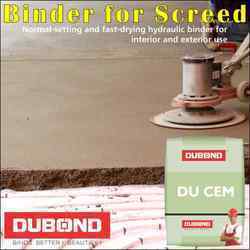 Screed is an underlayment that enables tile/ stone flooring to be installed on a smooth, level, hard surface. Solvent Free, Pigmented Self Levelling System Three component system, which provides a seamless floor which is dust free. Hygienic, easy to lay, hard wearing, chemical resistant system. Available in wide range of attractive colours.